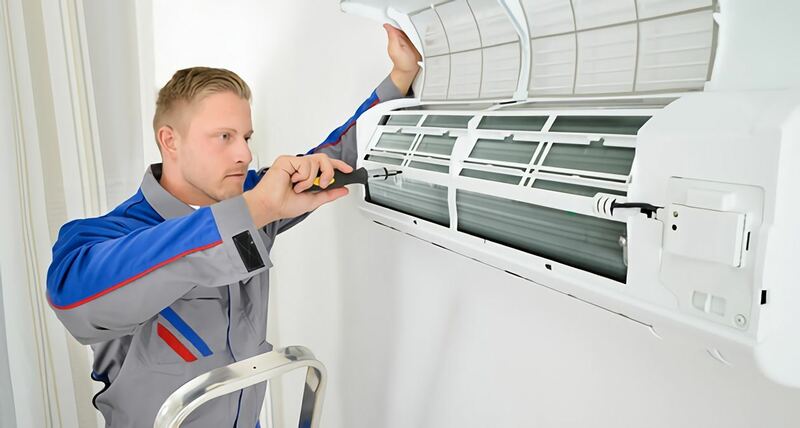 While 9% of HVAC technicians are self-employed, as per the U.S. Bureau of Labor Statistics 1, the majority works for companies performing maintenance, installation, or repair of heating, ventilation, air conditioning, and refrigeration units. HVAC technicians mostly perform their work indoors, such as in residential homes, schools, businesses or factories. They inspect equipment, identify problems, and repair or replace equipment so that it works properly. They also need to keep records of the work performed. In some cases, the technician may need to work outside in poor weather or may need to work in cramped spaces where HVAC equipment is located. O-Net Online notes that most HVAC technician positions require some type of education, such as a refrigeration technologies training program. HVAC training programs generally cover installation, operation, and maintenance of heating, ventilation, air conditioning, and refrigeration systems. Training can be completed in as little as 6 months at RSI. The profession is expected to experience faster than average job growth of 21% between 2012 and 2022, according to the BLS. This promising growth rate is due to an uptick in commercial and residential construction. Candidates with experience in computers and electronics have the best opportunities. HVAC technicians earned a median pay of $20.98 per hour, or $43,640 per year, in 2012, the most recent year for which data was available. Electro-mechanical technicians test electromechanical assemblies, interpret diagrams or blueprints, analyze test results, inspect equipment, repair or calibrate components of electromechanical systems to ensure that they work properly, and use hand tools to work on systems. They generally work with computer-controlled systems, including robots. In some cases, technicians will be expected to train colleagues in certain procedures. Electro-mechanical technicians generally work indoors where the equipment they service is located. It is highly common for an electro-mechanical technician to have vocational school training. RSI’s electro-mechanical technologies training program focuses on the fundamentals of electricity, residential and commercial wiring, and comfort systems. Moreover, it also covers solar energy technology and Photovoltaic (PV) Science. In many cases, electro-mechanical technicians must be licensed, which requires successful passage of an exam. The electro-mechanical technician profession is forecast to experience slower than average job growth of 4% between 2012 and 2022, according to the BLS 2. This slow growth is due to a decline of traditional manufacturing industries. However, electricians have a broad skill set that they can employ in a variety of fields and thus help them maintain employment. The median wage was $24.91 per hour, or $51,820 per year, in 2012, the most recent year for which data was available. RSI offers training programs for both HVAC technicians and electro-mechanical technicians. To learn more about these professions or gain insight into the course of study, contact us today.